This indicator generates signals for performing deals using alerts and colored dots on a chart. 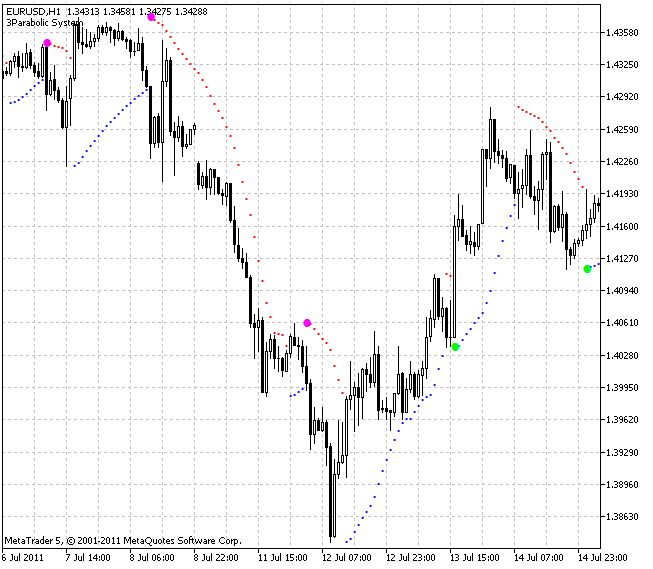 This indicator compares the signals of three versions of 3 Parabolic SARindicator. The versions are set at different timeframes: junior (chart timeframe), middle and senior. Senior and middle timeframes are searched for Parabolic SAR indicator trend signals, while the junior timeframe is searched for a trend reversal signals. For example, when parabolics are moving up at senior and middle charts while being lower than the current price and the parabolic has changed its location from "above the price" to "below the price" at the junior chart, then a buy signal is generated. A sell signal is generated the same way.